Kerala, the state well-known as God's Own Country for several reasons, was one of the first few regions in India where Christianity was introduced. Therefore, Kerala has always been an important settlement for Christians, and is one of the most important Christian pilgrimages in India. 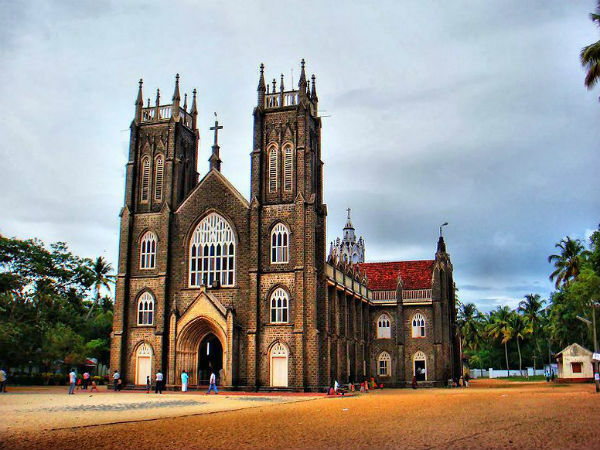 Needless to say, the beautiful state, that is home to marvellous backwaters, beaches, stunning hill stations and more, is also spread with numerous magnificent churches. If you're looking for a peaceful vacation along with celebrating Christmas this December, then here are the top 6 churches that you need to go to right away. Constructed in 1503, St Francis Church in Kochi is one of the oldest churches in India. Originally, this church housed the body of Vasco da Gama in 1524 since he passed away in Kochi. But 14 years later it was moved to Lisbon, Portugal. The church is built in a beautiful European style of architecture, a tall structure that eludes an old-world charm. Other places you can explore in Kochi include Fort Kochi, Marine Drive, Vypin Island, etc. Arthunkal is an important pilgrimage site for Christians as well as people of other faiths. This coastal town in Kerala is located 21 km from Alleppey and is mainly known for the magnificent St Andrew's Forane Church. Built in 16th century by Portuguese missionaries, this beautiful church was rebuilt several times in the following years. The church remains particularly crowded with devotees from all over the country during Thanksgiving and Christmas. Located in the revered city of Thrissur, Basilica of Our Lady of Dolours Church is a stunning structure that is built in Indo-Gothic style of architecture. It is a minor basilica of the Syro-Malabar Catholic Church. Spread across an area of 25,000 sq ft, it happens to be the biggest church in India. This church was built in 1814 and is also the 3rd tallest church in all of Asia. With 11 altars and double-storeyed aisles, this church is a must visit in Thrissur. Since Thrissur is also a significant pilgrimage site for Hindu devotees, you can also visit the famous Vadakkumnathan Temple and attend the Thrissur Pooram festival that takes place usually in April-May. Locally known as Palayam Palli, St Joseph's Cathedral was first built in 1873. Later additions were made where the final extensions of a Gothic styled bell-tower was installed in 1927. These bells were imported all the way from Belgium. Some of the other places you can visit in capital city of Trivandrum (also known as Thiruvananthapuram) include Kanakakunnu Palace, Poovar Island, to name a few. Fort Kochi gleams with the heritage of several rulers like the Dutch, Portuguese, etc. Amongst the many monuments, Santa Cruz Basilica is one of the significant ones since it is one amongst the eight basilicas in India. Initially this magnificent church was built by the Portuguese but was later recreated by the British. If you're at Kochi during christmas, make sure you don't miss out on missing this stunning church. Popularly known as Edathua Church, St George Catholic Church is a beautiful structure that is located in Edathua, a small town located about 12 km from Alleppey. It is nestled on the banks of river Pamba, and gets crowded with devotees mainly during April-May, when they conduct the annual feast. If you're in Alleppey, try going on a houseboat ride in the backwaters of Alleppey or just relax and indulge in birdwatching in the arms of nature.